Wisdom from the very beginnings of Christian monasticism can become a companion on your own spiritual journey. The desert fathers and mothers were ordinary Christians living in solitude in the deserts of Egypt, Palestine and Syria who chose to renounce the world in order to deliberately and individually follow God’s call. They embraced lives of celibacy, labor, fasting, prayer, and poverty, believing that denouncing material goods and practicing stoic self-discipline would lead to unity with the Divine. Their spiritual practice formed the basis of Western monasticism and greatly influenced both Western and Eastern Christianity. Their writings, first recorded in the fourth century, consist of spiritual advice, parables and anecdotes emphasizing the primacy of love and the purity of heart as essential to spiritual life and authentic communion with God. Focusing on key themes of charity, fortitude, lust, patience, prayer, self-control and visions, the Sayings influenced the rule of St. Benedict and have inspired centuries of opera, poetry and art. 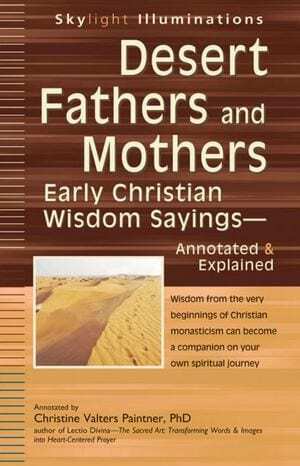 Christine Valters Paintner, PhD, opens up wisdom of the desert fathers and mothers for readers with no previous knowledge of Western monasticism and early Christianity. She provides insightful yet unobtrusive commentary that describes historical background, explains the practice of asceticism and clarifies the ancient desert wisdom that will speak to your life today and energize your spiritual quest. Spirituality and Practice has named Desert Fathers and Mothers one of the best spiritual books of 2012! As beckoning as the wide expanse of the desert and as clear as the night sky strewn with stars, Christine Valters Paintner's work offers the reader a good drink from the clear stream of desert wisdom. She honors the tradition while making it entirely relevant to our times." -Mary C. Earle, writer and Episcopal priest, whose work includes The Desert Mothers: Spiritual Practices from the Women of the Wilderness and Celtic Christian Spirituality: Essential Writings--Annotated and Explained.